Hi readers – we’re aware that the FT server has been erratic at best today if you’re accessing it via the site. We’re looking into this. Apologies, especially to any new readers who came looking for us after the MacCauley And Co. appearance this morning! Thanks for your patience. An elderly man takes in his orphaned young cousin. It is surprising, given that the man is known as something of a recluse, a retiring academic type – specialist in the later pagans and their mystical beliefs – seemingly more comfortable with books than persons. Or maybe it is not surprising for a man to take an interest in the welfare of a young relative, if interest of a distant kind. He asks the boy’s age, and such, and sends him off to be looked after by the housekeeper; and the housekeeper tells him, one day, of her master’s kindness, that he has taken in children before, a little gipsyish girl and a little foreign boy, although being gipsyish the little girl ran off after a few weeks, and being a foreign ragamuffin and naturally unruly so too did the boy. Strange dreams this young cousin has, of a thin thin body lying moaning, hands pressed to its heart; and he sleepwalks at night at times; and there are rats in the house too, huge ones they must be, for there are scorings on the young boy’s door and even scratches on his nightgown, all down the left side of his chest, after he has spent another night in a dream he cannot quite remember; and it might be rats or the wind in the cellars at night but the butler will not go down to fetch the wine once dark has fallen, for in that dark such scuttlings and sighings have a sound uncommonly like speech. And, now the boy is eleven and a half, something dreadfully exciting is to happen: for his uncle has asked him to sit up until quite eleven o’clock, and to come and visit in his study. Cometh the hour, cometh the robots: there is no other moment in pop history when Kraftwerk could have got to number one here – and were it not for those meddling DJs, they wouldn’t have. It still feels slightly odd and unlikely to be writing about them – it’s like Noel Edmonds deciding to champion “Jesus” and giving the Velvet Underground a chart-topper. 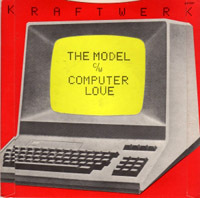 Not that “The Model” isn’t an obvious hit: it’s never been my favourite Kraftwerk tune, but as those DJs realised its translated awkwardness gives it commercial legs as a novelty record. That isn’t to say I don’t like it: all Kraftwerk’s immense virtues are here too. What am I missing here? I am a great fan of Yorkshire Tea for Hard Water, and on finding it in loose-leaf form, nearly wet myself in excitement – but upon opening the tea, you find something akin to… granules? Like Lift Lemon Tea? But they don’t dissolve! BUT, they are so powdery that they slip through any filter and strainer, leading to a well manky cup of GUNK. Wah! Sob! Cry! My life is so hard. AM I DOING SOMETHING WRONG? Or do I need to visit Taylors of Harrogate and ask “whut up”? OK, its not exactly teh same thing, but running out of beer at a beer festival is almost as shocking. True, the South West London CAMRA dudes can probably be more than chuffed at how successful this year Battersea Beer Festival at the backside of the Battersea Arts Centre (the BACside if you will). A packed friendly crowd, excellent Polish food and the always lovely surroundings of an old school London town hall now going begging (the chandeliers were no longer there). And certainly running out of beer is a proof of popularity. Why I remember at the Pigs Ear beer festival in 2007 when they almost ran out at 9.30 being quite exciting. But running out at 7.30 on a Friday night WHILE YOU ARE STILL CHARGING PEOPLE THREE POUND ENTRY is unforgivable. I had the second from last pint* of ale, a tasty mild, from the entire festival and witness fresh faced new punters eagerly trotting in with their freshly cleaned glasses. Yes they could get some Bigos, a few of the bottled European beers were still left and there might have been some stinky cider downstairs. But no beer at a beer festival? For shame CAMRA, for shame. *Half pint actually, I was not greedy. More excavations from the Freaky Trigger archives. If you find the commentary too self-indulgent you can simply enjoy the pieces by clicking on the link at the top right of this page! My list of the “Top 100 Singles Of The 90s” started as an attempt – largely successful – to shake myself out of a bad patch: the commitment to regular writing would impose a bit of structure on my day. To anyone who ever played any sort of videogame in the 80s, or if you even wanted to, or even if you DIDN’T but downloaded an emulator anyway because all the cheap hipster shops near you are selling tshirts with ropey graphics of FROGGER on them: you really, really should get Retro Game Challenge for the DS. Sure, it just sounds like another collection of retro mini-games, and that IS the basis of it but oh my, it is so much better than the sum of its parts! You play the part of someone whose DS is hijacked by an obsessive gamer named Arino, who boasts of his supremacy in ALL GAMING! Indignant at your petty noughties gaming, he sends you back to the past to challenge him, turning you into a kid to take on child!Arino. This has the utterly charming effect of placing two little kids on the floor in front of a tv and gaming console on the bottom screen whilst the game gets played on the DS top-screen. The kids crawl about, sprawl on the floor, punch the air, exclaim out loud at the scary bits, howl in unfairness, fish out magazines for hints and tips (familiar to anyone who read eg SEGA FORCE et al – yeah yeah I’m a generation after typing out debug scripts, deal) and cheer on each other. It sounds nothing special at all but the down to earth charm of it, even the kids stumbling around on the floor and switching on consoles has gotten me OBSESSED.